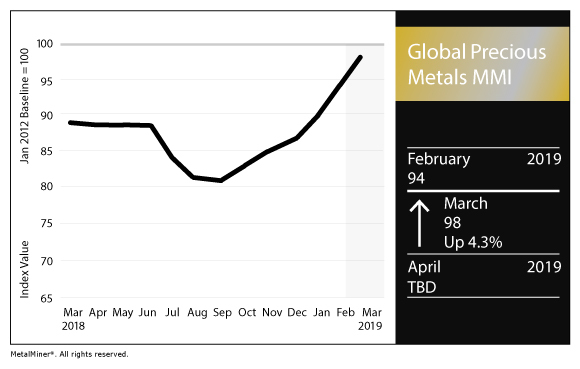 This morning in metals, we’re getting up to speed on where the tin market could be in a decade, what U.S. and Chinese trade negotiators are continuing to discuss, and where the EU car market seems to be heading (hint: it’s not good news). The International Tin Association (ITA) recently said that tin could experience “a surge of new demand from lithium-ion batteries for electric vehicles and energy storage of up to 60,000 tonnes a year by 2030,” according to Reuters. 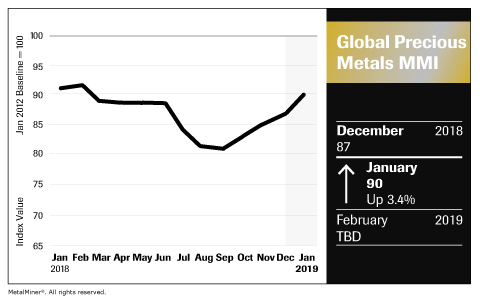 According to that report, the ITA did not forecast any numbers of overall tin consumption in 2030, but “it has seen rising interest in the metal for energy materials and technologies.” Last fall, the group went on record forecasting a global tin market surplus of 500 metric tons in 2018 mainly due to weaker demand in China, according to Reuters. Among the things trade negotiators for both countries discussed at the table recently, according to the WSJ (paywall), were a proposal to increase U.S. semiconductor sales to China to a total over six years of $200 billion (although “that increase would be generated in part by moving assembly operations of U.S. semiconductors from third countries like Mexico and Malaysia to China, allowing those products to be counted as U.S. exports rather than those of other countries”…so much for reshoring). The Chinese also offered “to eliminate a national vehicle-procurement policy that has given consumers subsidies to buy domestically made new-energy, small-engine and other types of cars,” according to the WSJ. Speaking of vehicles, while carmakers like Ford are worried about what a hard Brexit may mean for their plants, they may have bigger, more systemic issues when it comes to the E.U. and U.K. car markets. “European car sales declined for a fifth straight month in January,” and “passenger car registrations dropped 4.6 percent compared with last year to 1.23 million vehicles in the European Union and European Free Trade Association, according to the European Automobile Manufacturers Association,” as reported by Bloomberg. Of course, all eyes on on China and its auto market to see if glimmers of hope are on the horizon. This morning in metals, we’re tracking the following stories. Nucor Corp. breaking ground in the Midwest. Reuters reports that Nucor is planning to build a plate mill for $1.35 billion in Sedalia, Missouri, to be fully operational in 2022. The new mill would produce 1.2 million tons a year of plate products and create about 400 full-time jobs, according to the company’s release. “Tax reform, continued improvements to our regulatory approach and strong trade enforcement are giving businesses like ours the confidence to make long-term capital investments here in the United States,” Reuters quoted Chief Executive Officer John Ferriola as saying in a statement. 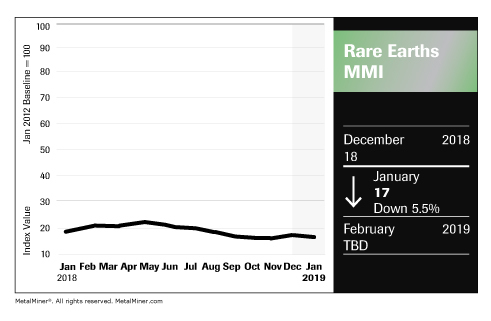 The Rare Earths Monthly Metals Index (MMI) fell 5.5% to land at 17, just one point shy of its all-time historical low (16). Certain constituent metal prices rose, such as cerium oxide and europium oxide. However, several others fell, including neodymium oxide (falling 0.6% to $45,649 per metric ton) and terbium metal (falling 0.7% to $566 per kilogram). China is doubling down on illegal mining and traceability of rare earth metals and minerals, according to new guidelines published by the country’s Ministry of Industry and Information Technology (MIIT) late last week, as reported by Reuters. As readers know, China’s been attempting to clean up its rare earths production sector for about a decade already, and it’s made strides toward its goals, but there’s still a way to go. Even after launching a crackdown on the rare earths sector in 2009 and being forced by the WTO to get rid of export controls in 2014, “illegal mining and production continued to disrupt ‘market order’ and damage the interests of legitimate enterprises,” the ministry stated in their notice, according to Reuters. The ministry is also committed to establishing a traceability system to prevent buyers from snapping up illegal material and will suspend licenses of companies that break the law, according to the news service. Across the Yellow Sea, patent applications for uses of rare earths have been going strong. High-tech heavyweights Samsung led the way, with Hyundai and LG not far behind. This morning in metals, we’re tracking a travel advisory for China issued yesterday by the U.S. Department of State — which could impact manufacturers and suppliers who have individuals traveling to and from China for business. Issued yesterday, the travel advisory cautions U.S. travelers to “exercise increased caution in China due to arbitrary enforcement of local laws as well as special restrictions on dual U.S.-Chinese nationals.” Some of that arbitrary enforcement is taking the shape of “exit bans,” which effectively means that Chinese authorities are preventing travelers from leaving the country on very shaky grounds, and in certain cases not allowing them access to consular services, not disclosing how long the traveler may be detained, and/or not allowing them to leave for years. For manufacturing organizations or their suppliers, individuals traveling in and out of China may be affected by these exit bans. Speculation as to why Chinese authorities have stepped up their arbitrary enforcement of travel regulations abounds, including retaliatory action vis-a-vis recent trade disputes with the U.S. and a Huawei executive being detained in Canada, but MetalMiner will follow up on this story as more details or insight become available. European carmakers still need steel imports to remain competitive. That’s what the ACEA, an association representing EU automakers, said recently, in response to the European Commission’s decision to propose definitive steel safeguards, according to Argus Media. “Motor vehicle manufacturing has increased by 5mn units per year since 2014, and some increase in steel imports has been necessary to meet this higher demand,” ACEA secretary general Erik Jonnaert is quoted as saying. 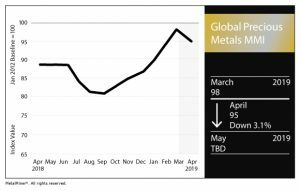 The Automotive Monthly Metals Index (MMI) fell 3.2% to a value of 92 this month, its lowest level in 17 months. 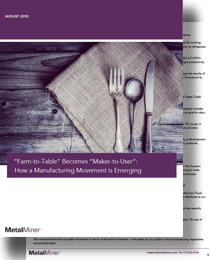 After riding high during mid-2017, above the baseline of 100, the Automotive MMI sub-index — tracking a basket of industrial metals and materials crucial to the automotive sector — has been in a continued overall downtrend since mid-summer of last year. 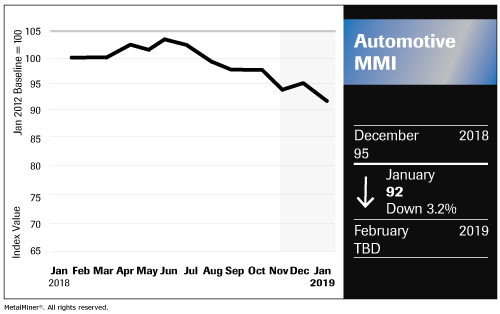 With both the commodities and base metals sectors ending 2018 on sustained downtrends, and a weak U.S. dollar, there don’t appear to be any immediate signs of the Auto MMI’s slide letting up. The sub-index’s overall descent, however, hasn’t stopped palladium’s scorching rise. Platinum’s ‘little brother’ is in a solid two-month uptrend, beginning the new year at $1,252 per ounce, by far the best single-metal performer. All other constituent price points that comprise the Automotive MMI — including U.S. HDG steel, LME copper, and the Korea price of 5052 coil premium over 1050 aluminum — fell over the past month. G.M. recently named Mark Reuss, the company’s former “product development guru,” as its new president, but that was couched in a near-simultaneous release of Q4 2018 sales figures — which weren’t great, according to an article in Industry Week. The U.S. automaker announced that fourth quarter sales were down 2.7% from the same time last year, the article stated. Ford and Toyota also lost ground in December, while Fiat Chrysler posted a double-digit percentage gain for last month. However, in China, the latest available data show that “a total of 2.55 million vehicles were sold in November, down 13.9 percent year-on-year, according to the China Association of Automobile Manufacturers (CAAM),” cited in China Daily — which, as Reuters reported, is the steepest plunge since 2012. So where does this leave the future of automotive demand? 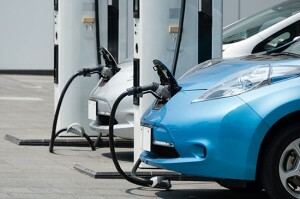 Certain industry watchers, such as former Reuters European automotive correspondent Neil Winton, expect 2019 to be the year that the growing interest and investment in the EV market squeeze traditional automakers and the sales of their product. However, the tiny slips could give way to bigger sea changes down the line. The days of healthy profitability for the makers of traditional gas-powered cars are numbered, he writes. “Demand for autos is at a dangerous tipping point, according to Morgan Stanley, as buyers put off purchases waiting for the new technology in the form of electric cars to take the stage,” writes Winton.